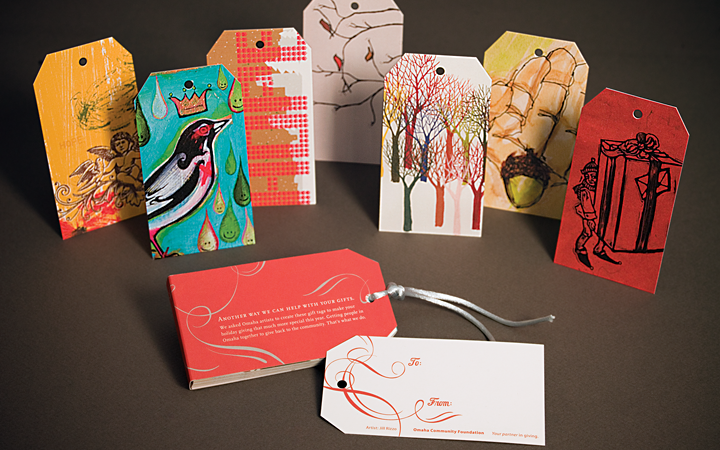 Gift tags to thank donors and gain exposure to new ones. Gift tags were created to promote the Omaha Community Foundation and were given to donors to thank them for their generosity. The Omaha Community Foundation wanted to show their donors their appreciation for all their generosity and introduce themselves to other prospective donors. The idea to create a set of gift tags came from their mission itself: helping people give. The tags served as a great conversation starter to help their employees explain the mission of the Omaha Community Foundation and the services they offer. Local artists were asked to create original works of art for the tags, strengthening the connection to the Omaha community and in doing so, they elevated the value of the gift beyond that of an ordinary set of gift tags.